Everything we know about weddings is changing. Old-school traditions are going out the window and being replaced by new attitudes. Wedding bands are among the many things that are changing. Traditional metals such as gold and silver are starting to be shunned after decades at the top of the jewelry market, and newcomers such as tungsten carbide are firmly taking over. However, even with a shiny new metal taking over, the changes do not stop there. Not only are tungsten wedding bands loved in their original sense, but colored, particularly black, wedding bands are proving hugely popular. Why are Black Wedding Bands so Popular? Of course, black fashion rings, not to mention other pieces of black jewelry, have been popular for many years, so the arrival of black wedding bands is somewhat belated. If you are going to buy a black wedding band, then you will want to ensure it is a quality product that is long lasting and looks impeccable. The first thing you should notice is the shine and finish. A black wedding band should never be dull. While you might not want a ring that is especially glossy, they should always be well polished in the manner that a colorless tungsten carbide ring would be. Additional features to consider with your black tungsten wedding band are inlays and engravings. Any inlays should be professionally finished and seamless, and the best examples will use unique materials such as bamboo, bone, meteorite, and ivory to create a desirable product. Engravings simply look amazing on black tungsten wedding bands, as the laser work exposes the tungsten underneath for a terrific contrast and appearance. 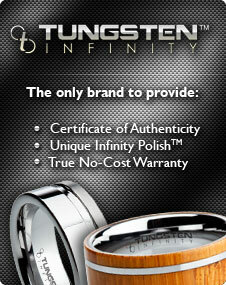 In short, you need to look for everything you would expect to find in any tungsten band. As always, the craftsmanship should be impeccable and the quality obvious. Black wedding bands are the future, so if you’re going to have one, you ought to make sure it is as good as it should be.